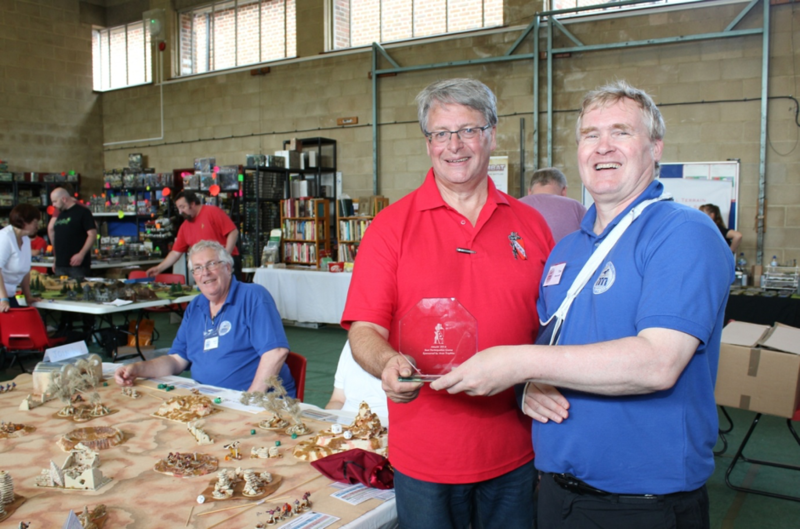 On the 16th and 17th July a wargames convention was held in Devizes. Attack! 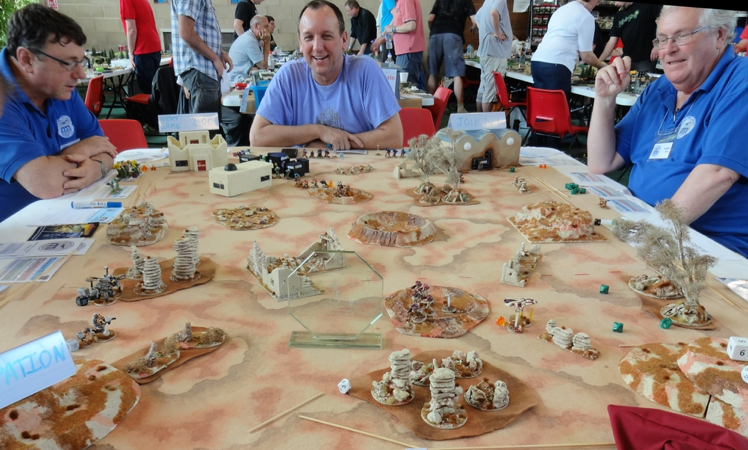 is a popular, annual event that has run for many years and now attracts a good number of well-known wargames vendors in the UK, including Warlord Games. Its main focus, however, is demonstration, participation and competition games. Given its location, Attack! attracts gamers from all over the Central South/South-West, probably over 1000 over the two days. It’s a show I’ve returned to time and again to see what’s new, what’s coming up and for ideas. 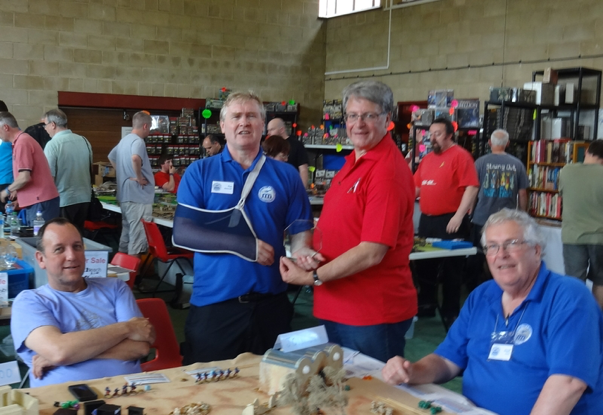 This year, our new, local club – the Boscombe Down & Amesbury Wargames Club (BDAWC) – decided to run a participation game to raise awareness of the club’s existence in this part of the world. 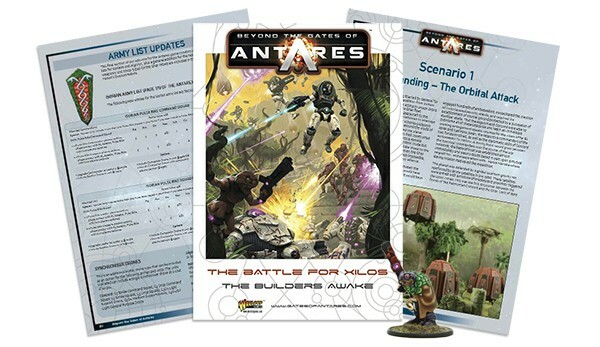 Naturally, given my fascination with Beyond the Gates of Antares, I offered to organise a BtGoA participation game for up to six gamers. Though space was running out fast, we managed to get an 8’x6’ table in one of the halls near the Warlord Games stand. The idea was to show off and introduce Antares. 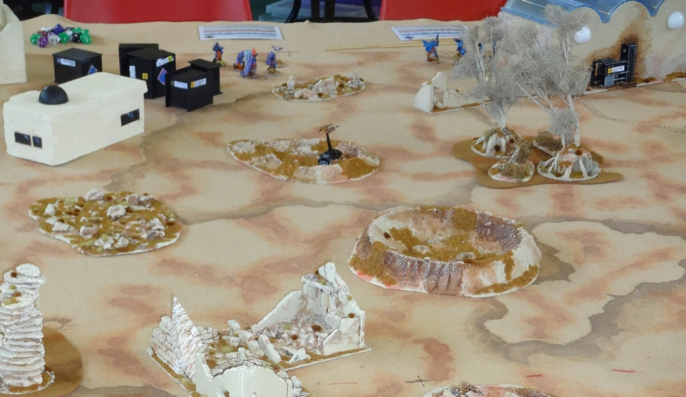 I had all the scratch-built terrain for the Shamasai world, a game mat and troops from five factions. 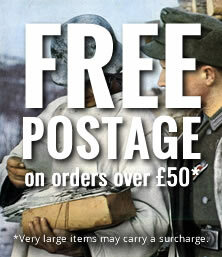 What was needed was a useful scenario that would last about an hour to hour and a half. The game we laid on also had to be quick to learn, fun to play and involve a fair amount of player interaction. This naturally led to the ‘Capture the Drones’ scenario from the core rulebook as I had tried it before as an intro game and found the shenanigans developing around the drones helped players buy into the game. 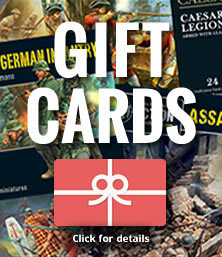 Each player was given two squads totally around 200-240 points. As this meant the Ghar might be penalised on units, I added in a disruptor cannon. For the points, though, it meant the Outcast Rebels would have three squads – which seemed fine given their tactics and drawbacks. a ‘6th player’ Concord force with a C3D1 and ‘all the trimmings’. Terrain was already sorted in the shape of that I had built for the Shamasai games and I had already decided to give each player a pair of squad-cards from which they could read their own stats and calculate their own saves/to hit rolls. 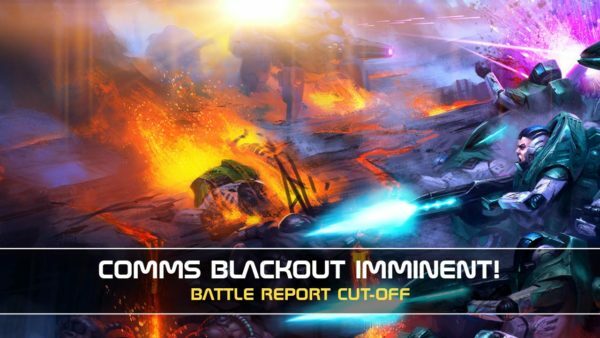 For flavour, I wanted to retain some of the important feel of each unit or faction but not over-complicate the game: Ghar had their Plasma Amplifiers and Disruptors, the Rebels had their ‘Rebel’ rule, the Infiltrators their pre-game move, the AI Assault squad their D-Spinners, and so on. 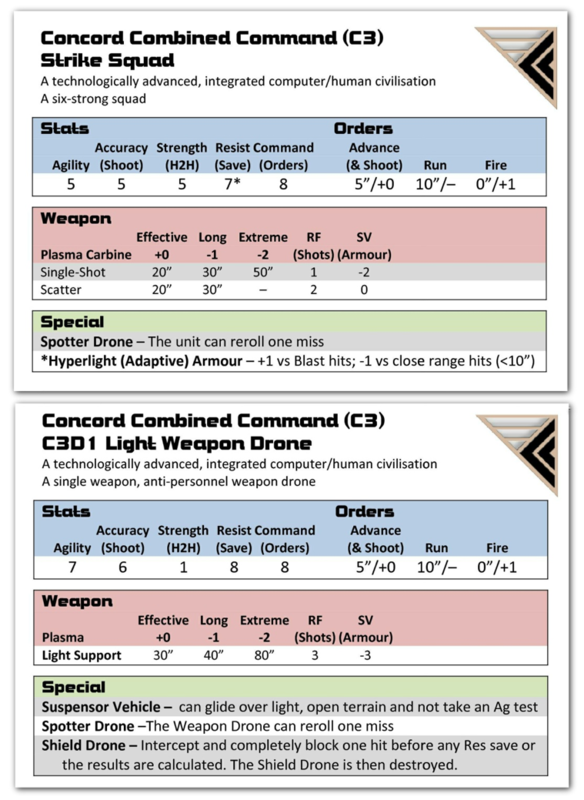 Given drones are a key part of the game, the units had the simpler buddy drones: spotter, batter or shield. I decided on a subset of the main rules for fast play. First off, Reactions were out, as suggested in the core rulebook. Secondly, a subset of orders was to be used, primarily as Ambush was out (no Reactions) but also as we had found previously that any unit taking Rally or Ambush was just wasting their time. 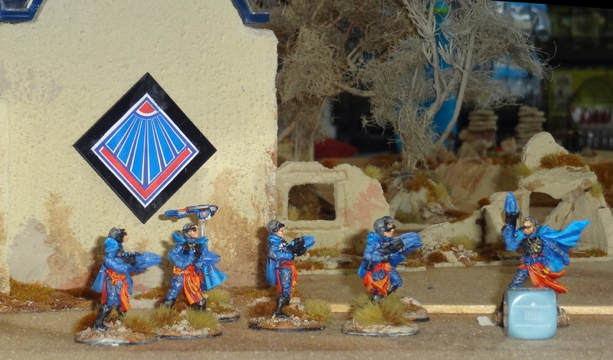 For fairness with such small squad numbers, the Distort Dice was dropped. Terrain is really important in Antares but has a wide range of effects so I simplified terrain into either Clear, Obstacles or Light terrain with Ag+0/Res+0 and Dense terrain with Ag-2/Res+2. Similarly, there were so many special rules that simplicity required that Leader, Follow, Hero and similar options were all dropped, though Command was kept to encourage the ‘mob rule’ approach of the Rebels. After much consideration, I also kept in the hyperlight and impact cloak armour differences. That left the Ghar with the standard rules, I had seen a Ghar player lose the Amp on turn one and get badly beaten up by the other players. Therefore, I adjusted the Plasma Amp rules so it became more likely the reactors would fail as the game went on, but with only a low chance early on in the game. This meant the nervous ’feel’ at potentially losing an order dice was still present, but it was less risky. To make the data drones (the objectives) a little less dangerous, they were given Mag Light Supports and a D10 action table that left out the orders we weren’t using. All that was needed was to train up other members of the club who had volunteered to help – one was a regular opponent, anyway, so needed little training! On both days we had three or four club members helping out on a rota, either talking to passers-by, sitting between players and explaining their options as the game progressed, or even taking a faction if numbers were a little light. As expected, this proved invaluable, greatly speeding play – teamwork! What was more wonderful was that two ‘non-SF’ gamers who helped throughout ended up really enjoying the game. The help from Warlord was also really appreciated. They gave us sprues, dice and starter rules to hand out to participants at the end of the game, gifts that were greatly appreciated by those involved. 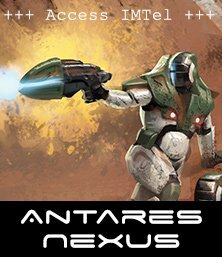 We know that several players promptly went out and looked for Antares products, whether from the Warlord stand, the bring and buy or other vendors. From a club viewpoint, the game couldn’t have been better. Not only did we see a lot of smiles and give a lot of fun, but our presence at Attack 2016! did reach the local players we were looking for, some of whom lived only a few miles from our regular venue! Finally, we were delighted and surprised when, half way through the last game, the organisers turned up with a glass plaque: ‘Best Participation Game, Attack 2016!’ Apparently, all the participants really enjoyed it and their secret appraisal had come up with BDAWC’s presentation of Beyond the Gates of Antares. Phil Mackie, one of the organisers, presented the trophy and the obligatory photos were taken. All in all, a great success!